After Google launched Latest version of Google Chrome 59 two days ago for Windows and MacOS, in addition to Linux, we were waiting for the version of the Android and iPhone iOS, today we received the version as an apk file to Android, You can download it from the link bottom, yes you can now download the latest version of Google Chrome 59 apk for Android free. Google Chrome does not miss any Android device and iPhone. 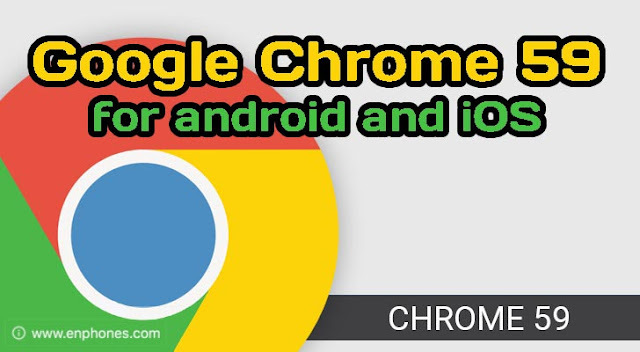 Although iPhone users use their default browser (Safari), they sometimes have to install Google Chrome as an additional browser, especially because it offers great features. In this topic we will learn about the most important features of Google Chrome's new additions and changes that came out of Android and iPhone. What's new in Google Chrome 59 for Android and iPhone? New form to receive site alerts. Security patches take great care of the privacy of the user and maintain his data. Support animated PNG images (APNG), a great alternative to GIF images. Google Chrome 59 is the latest version of Chrome browser, which is available for free download to all Android devices. You can download the apk app for your Android app by following the link below, while we will provide a download link for your iPhone when it arrives.